I chose to do this flag today because it cannot be denied that this is a historic day (this was originally written for Facebook on June 26, 2015 when the Supreme Court ruled that gay marriage is a right nation-wide), regardless of one’s opinion on the matter. Now, on to the FUN FLAG FACTS! Commonly known as the Gay Pride Flag, it was created by San Francisco artist Gilbert Baker in 1978 for the San Francisco Gay Freedom Day Parade. It is believed that the Baker drew inspiration from the Flag of Races, a similarly horizontal-striped flag used during the Hippie movement and featured red, black, brown, yellow, and white stripes to represent different nationalities. Baker reportedly chose rainbow colors after hearing Judy Garland’s rendition of “Over the Rainbow”. The original Gay Pride Flag featured eight colors, opposed to the six-color version we know today. Each color had its own meaning assigned by Baker: hot pink represented sexuality, red represented life, orange represented healing, yellow represented sunlight, green represented nature, turquoise represented art, indigo represented harmony, and violet represented spirit. By 1979, hot pink would be phased out due to fabric unavailability. Later that same year, Indigo and turquoise would be combined into a royal blue, giving us the Gay Pride Flag we know today. The Gay Pride Flag once held the world record for Largest Flag. Baker created the record-breaking version in 1994 for a 25th anniversary celebration of the Stonewall Riots. He produced another version in 2003 for the “25Rainbow Sea to Sea Project” in Key West, Florida. That flag measured a mile and a quarter long. 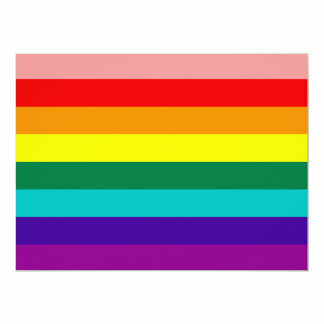 Despite one’s personal opinions about what the Gay Pride Flag represents, its impact on modern society cannot be denied. Since its introduction, it has become the most synonymous symbol of the LGBT community around the world, replacing several other symbols including the Greek Lambda and a pink triangle.